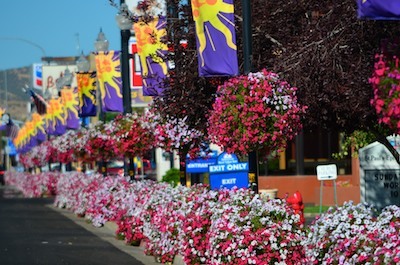 Flowers decorate the streets of Vernal, Utah. 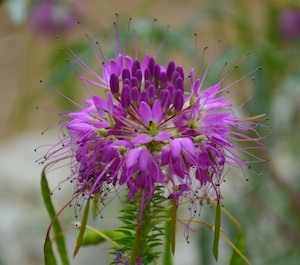 Early September, 2012 – From the brilliant colors of Flaming Gorge National Recreation Area in Utah we dropped south to Vernal, Utah. The town streets were lined with colorful flowers in planters and hanging baskets, and I hung my head out the window taking photos on the fly. What a beautifully decorated town! 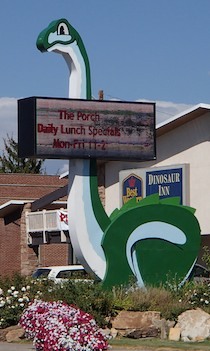 A dinosaur welcomes us to Vernal! We see a lot of small towns in our travels. Some we like immediately while others grow on us slowly. 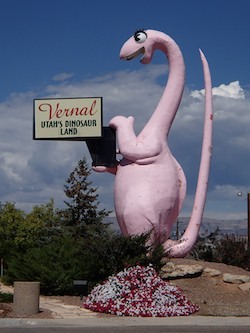 Vernal was one of those that made us smile right away. Some small towns have a theme, especially if it hosts a lot of tourists. The theme might be something general and a bit vague, like “seaside beach town” or “woodsy mountain town” or “college party town.” Sometimes you have to kind of hunt around to figure out what it is. Come stay with us at the Best Western hotel! 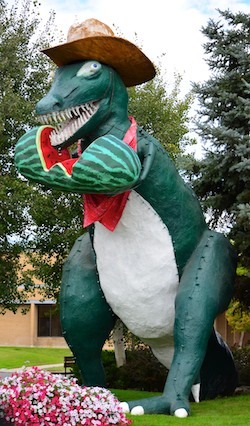 But Vernal’s theme is right out there, front and center: This is Dinosaur Town! Dinosaurs were everywhere. They were welcoming folks to town, hawking rooms at the Best Western, inviting kids to go swimming, and milling around outside the Dinosaur Museum. 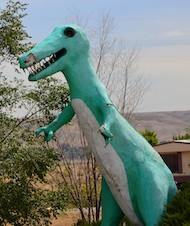 There were so many dinosaurs in this town that we did a special bike ride up and down the streets to capture as many as we could with the camera. What a totally fun place. 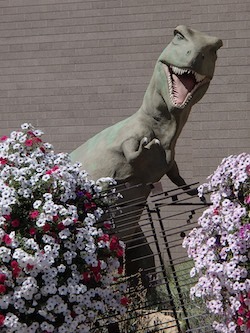 Of course, there is a reason this is Dinosaur Town, besides the townsfolk having a fascination with them. 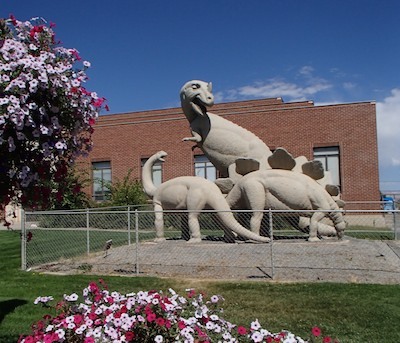 Vernal is the gateway to Dinosaur National Monument where paleontologist Earl Douglas found a nearly perfect Apatosaurus skeleton in 1909. It all started when he first unearthed a string of the beast’s vertebrae buried in the dirt in a nice little row. The skeleton now resides at Carnegie Museum (Andrew Carnegie funded the work of Douglas and later scientists who quarried bones here). Apatosaurus is a long necked and long tailed plant eating dinosaur that walked on all fours, stood about 16 feet high, and was 70 feet long end to end. If one of them tried to hide behind a typical one-story ranch style house, the head and tail would stick out either end. Watch out for that swishing tail! 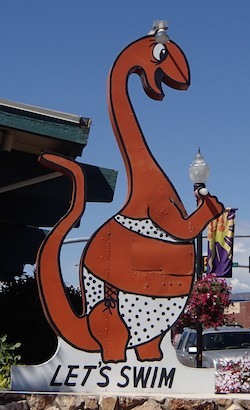 This big guy has also been known as Brontosaurus, a name I remember from my childhood. How did that 149 million year old skeleton happen to wind up on a hillside in the vast, empty, rocky area south of Vernal, waiting for a fossil-collecting paleontologist to find it in 1909? 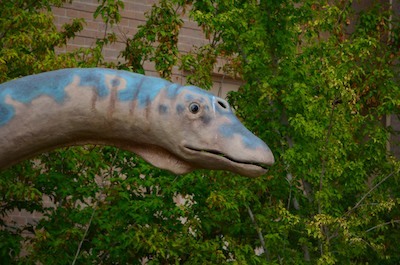 It turns out it was sitting in the middle of what scientists discovered was something of a dinosaur graveyard. Did you know dinosaurs liked watermelon?? Back in dinosaur days, all those millions of years ago, North America and Eurasia were just beginning to go their separate ways, and the climate was dry in this part of the world. Rivers and flood planes wound through the area. 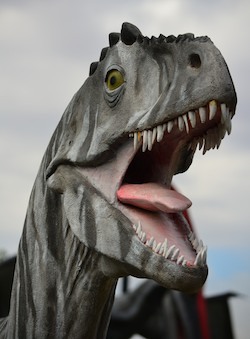 Dinosaurs ate the vegetation at the river’s edge, and as the water flooded and receded, they died in the muddy riverbed and were quickly embalmed in sediment. Over time, at a molecular level, the sediment replaced the organic parts of the carcasses, and the bones became petrified, or crystallized, into rock. Dinosaurs mill around all over town. In this area a lot of dinosaurs met that fate, and consequently the “Dinosaur Quarry” is a deep and wide field of bones from the Jurassic Period. The find that Earl Douglas made fired up the imagination of the early 20th century folk. These were the days before the children’s book “Danny and the Dinosaur,” the Flintstones’ “Dino,” and lovable, purple Barny. The newspaper accounts of the time had to follow the word “Dinosaur” with the explanation, “a pre-historic animal-reptile,” since not everyone knew what a dinosaur was. Is this a Disney Theme Park? Douglas’ dream was to allow the public to see what the hillside looked like when the topsoil was removed — since it is a veritable pile of massive bones — and he envisioned a viewing area built over the quarry that would protect it from the elements and offer shade to visitors. The National Park Service obliged a few decades later. A wall of bones is sheltered by a unique building. At the visitors center we hopped into one of the open air shuttles that the NPS provides visitors to get to the quarry site. We felt a little like we were at a Disney theme park when we jumped in. 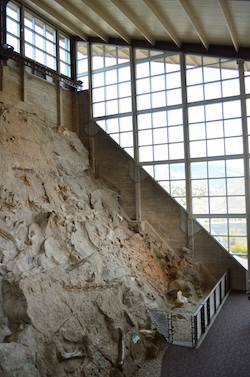 It is a short, steep ride to the unique quarry building. This was a dinosaur graveyard. The original building was considered a masterpiece of design, set off with a graceful butterfly roof. But the geology of the area wasn’t fully understood at the time, and natural forces began to wreak havoc with the structure. The National Park Service renovated the building in the early 2000’s and now it will presumably last a long time. 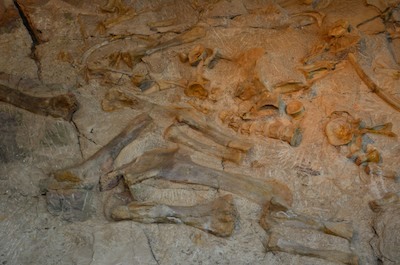 When we walked in the door, we found ourselves staring at a wall of dinosaur bones. It is hard to fathom how big these guys were and how long ago they lived. History came alive as we walked along this slab of earth where Earl Douglas and so many subsequent paleontologists have painstakingly studied these layers of bones. Vertebrae, skulls, leg bones and other intriguing things are all lying there, still encased in the rocky soil. 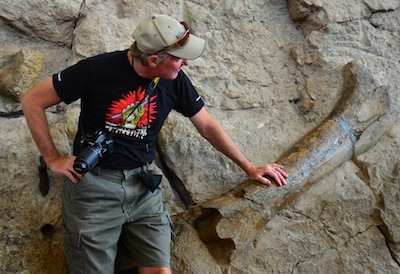 Mark checks out an enormous bone. Visitors are encouraged to touch the bones, and putting a hand on an immense bone is quite a thrill. However, we both still found it very hard to fathom the vast span of time that the dinosaurs existed (nearly 90 million years), and the antiquity of that era (they went extinct about 65 million years ago). Usually our visits to “ancient sites” take us to places where humans lived just a thousand or so years ago. That is one big head!! 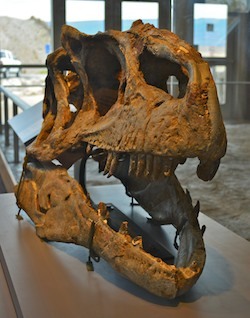 To our surprise, we found out Dinosaur National Monument is loaded with treasures from those more recent times too. 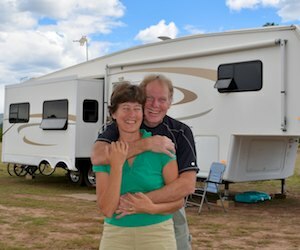 So we stayed for several days, seeking out some of the best petroglyphs we have seen anywhere, hiking and driving through some spectacular scenery, and wandering through two homesteads from the early 1900’s. 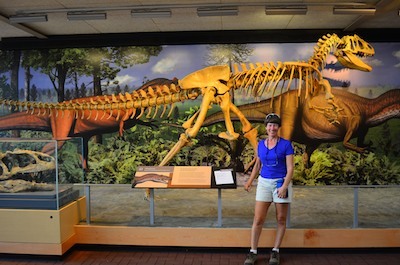 Click here for our next post about PETROGLYPHS and CYCLING at Dinosaur NM. Our story Dinosaurs and Much Much More was featured in the September 2013 issue of RV Life Magazine. This entry was posted in Utah and tagged Travel, USA, Utah, Utah Northeast, Utah Northern, WP Travel by Roads Less Traveled. Bookmark the permalink.